Home \ Sean’s 7 Day Flexibility Challenge is Here! I created this 7 day flexibility challenge so you can perform all your activities with ease and comfort…whether you’re a beginner, athlete, couch potato, weekend warrior, gym regular or professional ballet dancer – these 7 days of complete stretch/yoga/flexibility routines will challenge, test and alleviate deterioration in your body. You may also increase your Range of Motion (ROM) around your joints and decrease lower back discomfort and pain. Also, keep an eye out for a more positive mood and achieving deeper sleep every night. Stay consistent and you’ll be AMAZED at how you look, feel and move through life. Do this challenge with my groundbreaking 7 Day Pilates Challenge for optimal results! And, for even BIGGER results join my HUGE 30 Day Power Yoga Challenge. Share this challenge with your friends and family and in your social media network! 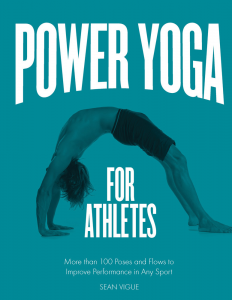 Own my bestselling book, Power Yoga for Athletes by clicking the photo below or pick it up at Barnes and Noble or Books-A-Million! Just did the inversion one. I agree it is legendary. What a Godsend the Tight Shoulders (Day 5) challenge was. I had no idea how much I needed this challenge until I was doing it. Bless you Sean! Just finished day 2 of this challenge. Hips and hamstrings! So good. Needed these stretches. Thanks Sean!